How to prepare easily at home thick pancakes for breakfast. Living abroad is a pleasure for me. I have the opportunity to know other cultures through the pleasure of eating something different every day. As the title says, today I am going to explain how to make pancakes. With this recipe you can make a thick pancake. Below a picture of the results. What do you think? Not bad ? 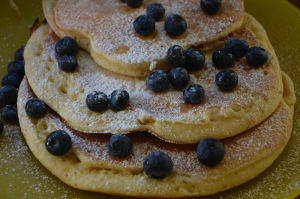 A pancake is a relatively thin, flat, round cake prepared from a batter and cooked on a hot griddle or frying pan. It may be served at any time with a variety of toppings or fillings including jam, chocolate chips, fruit, syrup or meat. Combine two eggs with sugar in a medium bowl. Combine baking powder, bicarbonate of soda and flour. Pour it into the medium bowl with the previous mixture ( eggs+ sugar) as explained at the number 4. In a separate small bowl mix yogurt and lemon zest. Add the flour to the mixture number 1. Pour the yogurt mix (3) into the flour mix (1+2) and fold in – don’t over beat. Heat a pan (medium heat) and melt a little butter only it if it suit you. Tip: I didn’t use it. Put one large spoon full of the batter into the pan and spread it out a tiny bit – like I said, it is quite thick. Bake until golden on one side, then flip over and bake the other side. Notes: If you mix sugar and flour first and then you add the flour, you might have some lumps. Don’t worry but you have to mix very well all the ingredients after you add the yogurt. What I suggest: Sift the flour to avoid any lumps and add the flour after you mixed eggs and sugar together. In my case, there was something missed in the recipe I found so I didn’t follow the steps in the order I gave you. Regardless of this missing information, my result was excellent and the taste was yummy and light as I wanted, without using any butter ( see the final result in the photo below) . So do not panic 🙂 and happy comfort breakfast. Note: If you like fruit you can decorate them with banana and maple syrup as I did.